Finally I want to take some time to catch up with the stuff I missed out posting about. So I will start with working through some Light Novels I read, because they are generally easier to review than a book where I actually have to think about something conclusive for each post. 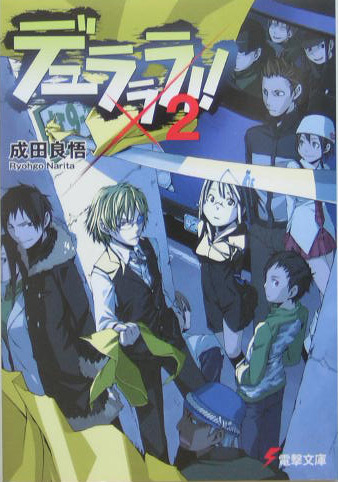 Durarara 2 picks up some weeks after the finale of the first volume. The case of the missing head is mainly solved and it now rests ‘safely’ in the hands of Orihara Izaya. Still new problems start to arise when a mysterious slasher, who plagued Shinjuku some years ago, begins reaping again and a strange spammer continues to attack the Dollars message board. Each member begins investigating on his or her own and finds a net of intrigue and tragedy beneath the apparent calm of the city that shocks their foundations and may ignite a battle of unforeseen dimensions. The second novel is a nice continuation of the first only this time it focuses on a different set of characters and decides to explore some relationships a little bit further. It’s nice to see how some characters are growing and it makes clear that the author actually has some idea where he’s heading with his characters. Rewriting this post retrospectively I have to admit that, among the first 3, I might have liked this volume the most. It featured a really tense plot-arc and did some heavy things with some of the characters. In the anime version they cut and relocated many of my favourite parts so I was a little bit dissappointed, I even thought about dropping the series altogether. Yes, it was heading in a different direction compared to the light novel, but if you strip a light novel of the character development it becomes rather void (the anime version made that quite clear). This is what this volume did best, giving characters depth.While, as I said, the plot was intense, the best part was the character development of Anri, who made it into my favourite characters because of that. I was not only able to believe her actions, I also felt with her while reading and started rooting for her. When something like that happens a light novel is pushing the exact right buttons with me. I really hope I can continue this series beyond the 4th volume sometime in the future, but right now there are other important things to read and the series has taken a far too episodic approach for my taste. Well, let’s see what the future brings.